elli & nels *in stitches*: welcome back, me. About six months ago, I bought a new sewing machine, a brother cs6000i, and it was love at first sight. (By the way, no one told me I should say this, and I'm doing it out of the goodness of my own heart because I like to give my opinions, but if you're looking for a sewing machine that's fancy but not TOO fancy, and is cute on top of it, well, you want this one. Oh, and it runs beautifully, and has a whole bunch of fun little features, many of which I have no idea how to use. Yet.) That was a lot of commas. Anyway. Then I was too afraid to touch it for about three days, because I didn't want to break it. Finally, I did, and I made a blanket. I had so much fun with it, that I immediately made another one. Actually the second one took me about two months, but that was because ADD, I mean life, got in the way, and also there was a LOT of hand embroidery involved. I would post a picture, but it's late and I'm too lazy to find my camera, so I'll do it tomorrow. And after a few more little projects, (including my first kid's garment ever that didn't look like a home ec. project) and a lot of Pinterest-ing, and a lot of thinking, and a fancy new phone with Instagram and Twitter and actual internet access, create3.5 was born. The create part isn't hard to figure out - that's what I like to do. 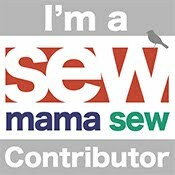 Sewing, embroidering, cooking (baking under duress), photographing, crafting, and, well, childbearing. You name it, and if it sounds domestic-ish and results in something cute or delicious (or cute AND delicious - hello, cupcakes), I probably do it. How well is yet to be determined. 3.5 is the hopeful part. Hopeful because I don't want there to be a 4.5 in a year. I've had two blogs before this, and am/was a member of a (mostly defunct) family blog, hence the 3.5. If I can keep life and ADD from getting in the way and instead channel them, this blog will survive, which is what I'm hoping for. Because I actually kind of enjoy this. I hope you do too. So. To finish up my introduction, I'm a mom of two adorable and sometimes naughty little girls, but I'm sure they don't mean to be. (I meant naughty, but I guess they don't mean to be adorable either. They come by that honestly.) heeheehee I complain about not having enough spare time to work on my projects, but I never seem to get much done when I do have time, either. create3.5 will (hopefully) be my motivation. Beginnings, middles, and ends of projects will be posted at random, giving me some accountability to JUST DO IT, and you, well, hopefully some entertainment, if nothing else.